The XP8 retails in at 399.99. 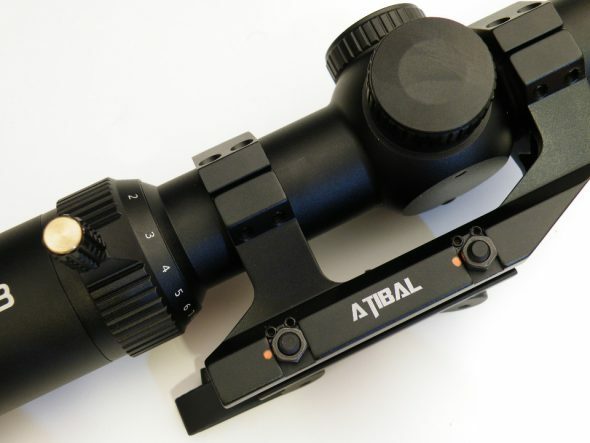 That’s a big bill for a Chinese made optic, but at this time the market rate for similar optics runs from $375-$399 so Atibal is in the price ballpark for an entry level 1-8. The overall fit and finish is quite high. The anodizing, the brass threading on the caps, the turret assembly, the illumination knob, and the magnification ring all look and feel like quality components. There is no grit on the threading, no grit or crunchies on the mag ring, and the glass is clear and bright. The windage and elevation assembly is finger adjustable, and has the nicest clicks of any low power variable I have handled, even beating my experience with the Razor HDII and even the Japanese Velox. As you can hear on the video below, they are audible and tactile. It is almost a shame that it isn’t a taller capped turret with a zero stop for when you want to dial in the dope. While you can make field adjustments, the turret markings are not visible from behind the rifle, and to dial in dope or windage means you have to look at the top of the turrets and go from there. This is more of a set and forget type optic since it has a etched BDC, so not everyone will want that feature and thus increased cost. Included in the box are lens caps, instructions, a “quick-view” detachable throw lever, a cleaning cloth, and a battery. My model was sent for evaluation with the TPM mount which at this time is sold separately. The XP8 with throw lever, TPM mount, and lens caps. Illumination is daylight visible, but not red dot bright… and I don’t believe there is a red dot bright 1-8x variable in this price range; however, the illumination is a marked improvement in brightness over their velocity (now known as the Velox) and is substantially brighter than my old Viper PST. The illumination knob has 11 brightness settings and accepts a CR2032 battery. A spare battery holder is present in one of the caps. Field of view is 105ft at 100 yards at 1x, and 12.45 yards at 8x which are the same specs as the Burris XTRII for reference. The eyebox is forgiving and easy to acquire at 1x, but quite sensitive to eye placement at 8x. This isn’t unique to the XP8, as any 1-8x optic will push the lens capability to the max. The reticle is a center 1 MOA dot and illuminated diamond with a BDC calibrated for 62 grain ammunition. As in the video, you can see the BDC matches well to a 55 grain loading out of a rifle length platform. The T.P.M. mount is a novel quick release mount where the latches on the assembly are located in an ergonomic position, and this makes the removal of the mount very easy. It *IS* easier to remove this mount vs my American Defense Industries X tended mount, for example. Otherwise the T.P.M is also a standard quick detach mount intended to get you up and running without breaking the bank. It is clean, the hardware is torx style, and after I used threadlocker on the rings, nothing has shifted and there were no apparent issues with the mount during testing. It remains rust free after my water testing (we will get to that later). All Wet. Watch the Video. Out of the box the optic impressed me with the fit and finish, so I had high hopes for the range. I sighted it in at another range session by shooting at 25 yards and using the 400 yard stadia line at 8x and this gave me a almost dead nuts 100 yard zero. That extra magnification made a huge difference in how easy it was to sight in the optic. This is my first 1-8 LPV, so to say it will spoil me is an understatement. Once home from the first range session, I decided that I did want the mount to be a bit tighter, so I adjusted the mount another turn and re-clamped it to my rifle, fully knowing that I would have to re-zero because I did that. The next range session I went out and found the optic was still on paper at 100 yards despite the tightening of the clamp. I used a sight in target which features 1 inch boxes for easy scope adjustment. I counted that my first group needed to go 5 clicks down (2.5 minutes) and 8 clicks right (4 minutes) and I dialed that into my scope. Bullseye. The click adjustments are true and accurate. The click adjustments were, as true as I can tell, accurate 1/2 x 1/2 minute W and E adjustments. They tracked accurately, and the mount returned to zero reliably. I then shot five rounds (visible on the diamond at the top right of the target) and clicked down 5 minutes, shot a group, and clicked back up 5 minutes and my group came right back to where it started. I then dismounted the optic from the rifle and tossed it a few feet down range into the grass. I wanted to test the return to zero and it did retain its zero. As you can see on the video it was still on slightly at the six of the diamond. I did some position shooting and ran around the great outdoors, and the optics 8x magnification was a boon to accurate shooting even at 100 yards. After I ran out of ammo, I dunked the optic in the wet. I submerged it again to check for leaks or internal fogging and it remained fog free. The water temperature was about 50 degrees, and nothing appeared to enter the optic and the turret assembly and battery compartments remained dry. The internals were also free of any apparent moisture. Going for a dip. After a dunk, there was no water leakage or fogging in the optic. So my test is not a torture test per se, but simply a bare standard test of the advertised capability of the optic. It performed well, did not break or leak, tracked true, and the fact that it lets you dial into 8x for $399 with an included throw lever and lifetime warranty is a good start for shooters wanting to stretch their rifle a bit further than the 1-4 products on the market. Let me also re-iterate that having access to 8x is amazing. Even at 100 yards, it allows you to sight in and hold true with greater precision than 1-4, 1-6, etc. This is obvious. Having owned a Razor HD II, I liked the step up to 6x very much… but now when I shop I will be looking for variables in at least 6-8x exclusively. It makes that much of a difference. I won’t be selling my 1-4x optics anytime soon though, as they have their place in my optics lineup as well. Variables continue to advance in capability and decrease in cost, and having access to 1-8x optics such as the XP8 will further advance the range and capability of our nation’s Riflemen. Solid and surprising, the XP8 has really punched through the crowd of low-cost Chinese variables and they have put together a fantastic option for shooters on a budget. So who would best be served by a XP8? Shooters wanting to trade a few feet of field of view at 1x for a full 8x magnification will be well served by the XP8; it would also make an excellent entry-level optic for 3 gun competitors who are taken back by the high cost of the total equipment package. Price per performance, the Atibal Xp8 offers plenty of bang for the buck, and if it holds up to long-term abuse, it will be a great addition to let new shooters better realize the long-range capability of their rifles. *Note* I was sent the XP8 for test and evaluation by Atibal, as I have a good relationship with the company. He sends gear, I test it, he gets feedback. The testing information included herein is all true. I have put together a video for viewers to witness for themselves the discussed aspects of this review. It was tossed, drowned, and tracked zero without flaw and suffered no malfunctions. Atibal and I have no financial relationship. The reason this disclaimer is here as I want my readers to know that honesty and integrity are essential concepts to firearm journalism and yet are sorely lacking… I pull no punches here. I hold The New Rifleman to a higher standard. KAC RAS M5 Seconds: Its Purple. How do you think the reticle drops will match a 77 SMK at about 2600 fps? I will post some of that info the day after tomorrow. My phone broke twice in two weeks, so my use of STRELOK is limited for now lol. Once I get my phone back I will let you know how the drop matches. But the magic of 2nd focal plane variables is that as you move through the magnification lever your optic can be adjusted for dope. If you are at 6x all the drops corrospond out to 1000 yards darn near perfectly. At 8x not so much. I’ve been curious about this one. Thanks! It is a quality product as far as I can tell. Really a jump ahead over any other Chinese product I have handled. How does it compare to Primary Arms 1-6×24? In all honesty they are likely very similar regarding build quality. If you notice the turret assembly and form factor they are both likely made by the same OEM from china. So the difference is the specs of course one being a 6x and the other 8x max, the reticle, and the included throw lever with the XP8 all factor into the differences. Warranty is 3 years on the PA product and lifetime with Atibal. So overall they are similar products spec’d out by different companies for import. Just got to decide which feature set interests you more. Glass quality? Heard some *blah* things about the Vortex Strike Eagle 1-6x as an example. Scale of 1-10 for the difficulty of finding a clear view at 8x mag? You mention it was “quite sensitive”. Finally, any idea on the battery life of the reticle on a reasonable brightness? Thanks for the early review, and hope you get a lot of exposure for being the first XP8 video/article out there. I haven’t handled the Strike Eagle, but they appear to use the same OEM so I suspect glass quality will be similar. The eyebox at 8x is small, if you drop down into prone for a long range shot, the eyebox shrinks considerably. 8/10 but again if you look at other 1-8×24 optics, they all have around a 3mm exit pupil at 8x. Objective in divided by magnification = obj out in mm. Even the new 28mm Trijicon can only improve the eyebox by 0.5 mm over the 24 mm optics at 8x. Yep! Nothing surprising there, strongly considering either the XP8 or the PA 1-6x to avoid the exit pupil situation, so was going to hear your thoughts on those specifics. I’d HEARD that Atibal requested better glass than what their competitors use out of that same OEM factory, but don’t really have a way to confirm it ahead. Have you had a chance to test the battery life for illumination? Didn’t see anything on their site about it. I’ll likely end up grabbing the XP8 based on your review and due to the 30 day money back and lifetime warrantee. Several months ago spoke to one of the owners and I believe they are trying to start using Japanese glass. Can you range with reticle in any way? The pdf on their site only shows says .5 moa dot and some elevation lines. Doesn’t say how big the diamond is. Is it 9 or 18 inches at 100 or what?